I wouldn't say wedding planning is consuming me at the moment - with just under 7 months to go, I'm still feeling fairly relaxed! Our most pressing need is sorting some kind of invitation; as it falls on a bank holiday in August, we want to give our guests as much warning as possible. We have a few ideas floating around in terms of designs but can't really get started with anything until we have confirmed a schedule for the day with our venue. As such, I'm feeling a bit stuck at the moment as we've pretty much sorted everything else (!) so instead I have been busying myself with collecting decorations and little DIY projects! I never really had a colour scheme in mind prior to booking our venue - although I was quite taken with the rainbow pastel idea for a time, then mismatched florals!- but upon seeing the farm decided it would suit something simple, yet effective. I am currently in the throes of a five-year-and-counting love affair with rose gold, as you may have noticed! If I recall correctly it began with my discovery of the Sleek blush way back when, and intensified when I began working in jewellery. 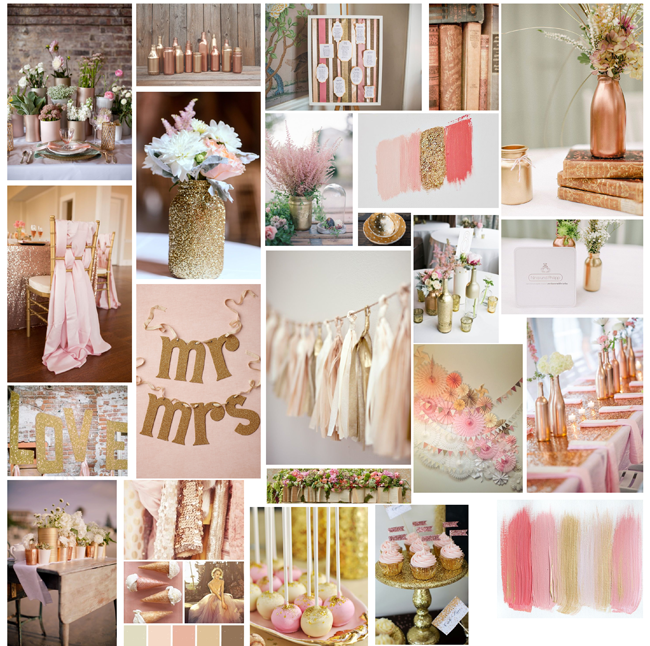 After much perusing of Pinterest I hit upon the idea of combining soft pinks with hints of metallic copper and gold glitter, helped along by the copper trend emerging in homeware at the moment - it'll be a rose gold dream! I find Pinterest such an indispensable tool for inspiration at the moment, but I've also been trawling through clothing and homeware sites looking for bits and bobs to fit in with my ideas. A lot of our decorations will be DIY - I'm planning a post dedicated to this somewhat closer to the day - but I've been collecting jars and bottles like they're going out of fashion, and armed with a few cans of gold and copper spray paint I'm fairly confident I can pull off some of the delightful table centrepieces I've seen along the way! I'm also planning on wearing gold sparkly shoes, have purchased rose gold jewellery for my lovely bridesmaids and am determined to find a method of incorporating the colour scheme into Jon's outfit (but ssh, he doesn't know it yet).In terms of make up I haven't quite decided yet but will try and incorporate the colour scheme somehow, just to keep it all tied together. Above is just a selection of beautiful ideas I've collated on my Pinterest boards - I would love to hear your thoughts! Brides and brides-to-be (and indeed, anyone who has such thoughts about their wedding!) - what colours are your favourite? How did you go about adding them into your day? So nice to read a post from a fellow bride to be :) so exciting we're getting the same weekend too! You've inspired me to be more creative with DIY decorations, your colour theme will be gorgeous!